I mean, especially one gets this idea in "Escape from the Mysterious Beyond". Red Claw and Screech don't appear to have gone looking for their companion. You can almost see the "I'm doomed!" 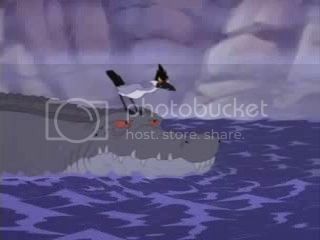 look on Thud's face when he sees Chomper and Ducky getting rescued and believes he's going to be left there to die. Also, Thud did turn on Screech and Red Claw by helping the others get away. Personally, I think Red Claw thinks he's better than Screech and Thud and views them as his servants. Red Claw might think he's better because he's bigger. Screech might be able to tolerate it but I think Thud secretly doesn't like it. It would explain why Red Claw didn't try and go find Thud. He didn't consider him worth it. Screech might have cared, especially if he and Thud are indeed brothers, but, maybe, just maybe, he and Thud don't get along too well either and Screech is too concerned with serving his master Red Claw to care about his brother enough to challenge Red Claw. Since these three appear to be detested by the entire world, it is likely they are outside the social norms of their own species, for one reason or another. As such, they are the dinosaur version of caravan robbers. They cooperate because there are spoils to be captured and divided, but they don't really have any feelings towards each other. They aren't the only ones in LBT that do that either. It's hard to say if Dil and Ichy are abnormal for their species, since we don't really know much of their reputation among others, aside being predators. It is normal for crocodiles to hang out with birds, although these birds just clean the croc's teeth, not help them hunt. Though there was that episode of the TV show with the bellydraggers, and they saw perfectly fine. Maybe Dil was born with a sight defect, or maybe she's just really old and can no longer hunt on her own. She would have become a burden to whatever group she belonged to, so they abandoned her. Then she met Ichy. Why Ichy would work with her, I'm not sure. He's the only sharpbeak we ever see (feathered I mean), far as I know. So it's difficult to say if there's anything wrong with him. One idea I heard long ago is that maybe he forsaken his original diet (perhaps fish and insects) in favor of dinosaurs, which made him an outcast among his own kind. All in all, it doesn't seem like those three value each other that much. I was sold on this when I watched Escape From The Mysterious Beyond, and Thud said something like, "Your friends aren't coming back, little biter." Sounds like it reflects his own experiences or beliefs regarding those in need. Maybe one of the unspoken mottos in the Mysterious Beyond is "every dinosaur for him/herself." Though I suppose it's possible he was saying it out of spite...But I think the only reason Red Claw, Screech, and Thud hang out is because they each have something to gain from it; not because they're friends, exactly. But like I said, just speculation. Quote from: fanciful_flyer on April 03, 2015, 10:50:43 pm All in all, it doesn't seem like those three value each other that much. I was sold on this when I watched Escape From The Mysterious Beyond, and Thud said something like, "Your friends aren't coming back, little biter." Sounds like it reflects his own experiences or beliefs regarding those in need. Maybe one of the unspoken mottos in the Mysterious Beyond is "every dinosaur for him/herself." Though I suppose it's possible he was saying it out of spite...But I think the only reason Red Claw, Screech, and Thud hang out is because they each have something to gain from it; not because they're friends, exactly. Intriguing notion, “Every dinosaur for him/herself” being the mantra and creedo of the mysterious beyond. This would be in direct contrast to the collectivism of the Great Valley and how the Gang of Seven take care of one another. Could this be a LBT version of communalism vs self reliance; the herd versus the lone wolf (dinosaur)? That would be a very interesting concept to explore in LBT. Well, considering that Red Claw is a lot bigger and stronger than his companions, it would be obvious that he considers himself to be superior to them, and might not care much about their lives for that matter. He evidently may just care about himself and his own interests. Like what were Screech and Thud doing when he was chasing that herd in The Lonely Journey? The fast biters' relationship with each other is really not explored at all. Are they brothers or not? We may never find out. But considering that shortly after the earthquake that separated the gang from each other, they run into Screech. Who knows, If he had not encountered them at all, would he have gone to search for Thud? It's possible. Are Screech and Thud brothers?